This review has not yet been approved by the owner of this writing service. 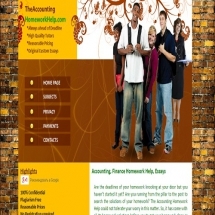 If you are the webmaster of Theaccountinghomeworkhelp.com, please Contact Us to approve or remove this review. All in all, the website is rather barebones: there is almost no useful information there. No price calculator or, for that matter, price chart, almost no data on the service policies, no working chat, no samples... You don’t have to register with the service to deal with it – it can be perceived both as a good and as a bad thing, for on the one hand it makes ordering easier, but on the other hand makes the entire arrangement rather shoddy-looking. The prices cling to the lower side of the cost scale, ranging, on average, from $13 to $25 per page. The price of a particular order depends on a number of factors, such as deadline, word limit, complexity of the task and some others. The longer the assignment is and the more time the writer is given, the less is the per page price. A surprising thing about TheAccountingHomeworkHelp, considering how unassuming its website looks, is its customer support. Although the live chat is constantly offline (due to technical problems, as I was told), and the only way to contact them is via e-mail, it seems that somebody is constantly on a lookout for new messages, for I always received answers to my queries within minutes of sending them. The answers were polite, detailed and written in fairly good English, which is more than can be said about many other writing services. The quality of writing on the website itself is passable but nothing more; samples are adequate, but it is hard to judge the current quality by them – the service only sends out very old samples in order to make sure it doesn’t harm those who ordered them. TheAccountingHomeworkHelp is a weird-looking organization. On the one hand, their website gives off an impression of a slipshod affair whomped up in half an hour some five-seven years ago and never adapted to the changing Internet environment. On the other hand, customer support via e-mail works perfectly, the prices are competitive and the quality of writing seems to be adequate. Decide for yourself which aspects are more important for you.